BitDefender is the best antiviruses with top class defending ability.BitDefender Antivirus Pro protects PC from a number of online threats, including viruses, spy ware, phishing scams, and more. 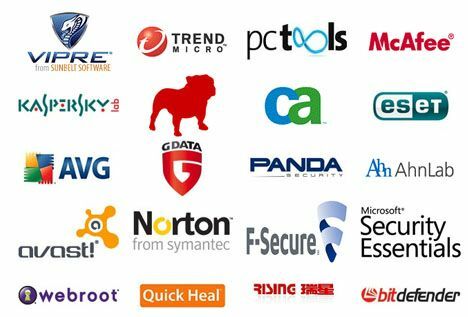 The software basically covers from every angle, protecting PC from threats on the Internet, email, an…d even instant messaging. The program scans all web, IM, and email traffic for malware. The software is even equipped to encrypt the IM chat conversations.It provides hourly definition updates for latest threats. Kaspersky Antivirus is often treated as the best available Anti virus application and has a special version for file servers. It covers almost all sections needed for a top class security.Kaspersky is known for their quick response to new viruses, and they’re often among the first to detect new viruses in the wild. One reason the software is so effective is because it is updated regularly and is proactively looking for new security threats. The malware landscape continues to change, and Kaspersky adjusts to address the threats. Norton Antivirus is one of the most popular and well known anti virus application.Norton AntiVirus 2011 does a great job of balancing system resources, simplicity, and (most importantly) security. The protection level is second to none, and new features continue to set the standard for antivirus software. The latest version has the ability to map your wireless home network and safeguards your wifi networks.Norton has managed to use their unique strengths to deliver an excellent antivirus program with a great overall user experience. McAfee is one of the leading antiviruses in security industry.McAfee also produces an enterprise-level product named VirusScan Enterprise: McAfee has designed this for use on larger networks. It contains features intended to make management of antivirus software on multiple computers easier.McAfee introduced 2 features ScriptStopper and WormStopper. But it has no support for P2P File Sharing, Instant Messenger and Registry Startup. The inbuilt updater updates virus definitions on a regular basis to keep PC up-to-date. AVG Antivirus offers a number of compelling features and the right technology to keep PC protected.AVG protects from hackers, phishing scams, adware and malware that come through email or IM. AVG even scans outbound email to make sure you don’t accidentally pass a virus along to others. And of course the software protects from other forms of malware, including worms, keyloggers, Trojans and rootkits.With innovative new features and improved performance, AVG 2011 is better than ever. The new social networking protection and LinkScanner up the ante with proactive web protection, cloud antivirus and a security network. Webroot Antivirus with Spysweeper is the perfect virus/spyware combo. The software is easy to use, and features effective protection and performance.Webroot monitors and detects all sorts of malicious files and just plain unwanted programs like adware, dialers, cookies, and keyloggers. The integrated Spy Sweeper is an amazing standalone anti-spyware software that in itself protects from a variety of computer threats.The only thing keeping this software out of the top slots is the lack of a few features like a battery saving mode and rescue CD. Avira Antivir Premium is one of the best in the business, and has several compelling features that make it a great choice for antivirus software. Avira AntiVirUS is filled with great features that enhance security, performance, and convenience. One important feature is that the scanner works in real-time. Avira scans all files as they are accessed, in the split second before they are opened and have the chance to infect your PC.The software also incorporates advanced technology that protects from the constantly changing virus landscape.And while the software didn’t offer some convenient features (like a silent gamer mode) that others have, the effectiveness is second to none. ESET NOD-32 is a great desktop security solution, complete with effective protection and advanced features. Eset Nod32 is particularly useful for home users looking for a simple “down-to-earth” security software that they can simply install and let the software do the work for them. Eset has proven to be one of the best overall performing antivirus software.Eset Nod32 Antivirus certainly isn’t as far-reaching as the upgraded Smart Security, but the scope is definitely on par with other leading antivirus competitors. Eset works behind the scenes to deliver protection from dialers, adware, and keyloggers. Panda Cloud Antivirus uses a community-based approach to quickly identify new threats spreading via the Web. Processing of these new threats is done in-the-cloud, saving your system resources and making for a lighter and far more proactive antivirus software.It provides a full range of protection, from antivirus and antispyware to behavior blocking and rootkit detection. Panda Cloud Antivirus even protects while you’re offline. An added bonus, Panda Cloud Antivirus disables the ill-advised autorun feature in Windows that has led to a tremendous population of autorun worms. The latest version of ZoneAlarm antivirus comes with strong removal ability of most dangerous viruses and multilayer security for PC. But it is not certified by any of the three major independent testing labs Virus Bulletic, Checkmark, or ICSA. Zone Alarm scans uses lesser possible system resources.